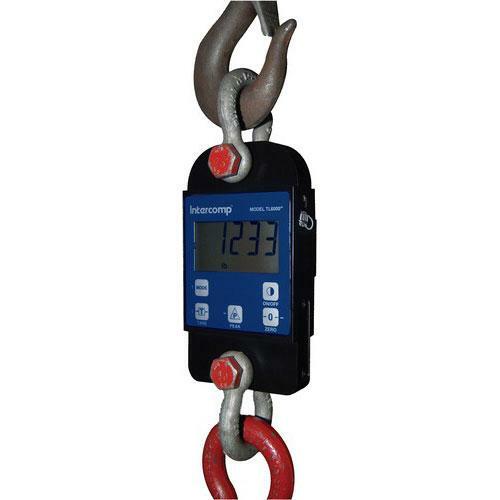 Intercomp offers the industry’s most extensive line of crane scales, and can provide your company with a cost-effective solution to virtually every overhead industrial weighing application - ranging from 25 to 600,000 lbs/ 12.5 to 300,000 kg. A cost-effective solution for virtually any industrial application. Cranes, riggers, shipyards, construction sites, surveyors, inspectors and utilities demand cost-effective yet technologically advanced solutions for processing, monitoring and controlling overhead loads. The TL6000 is the industry standard bearer, delivering unsurpassed accuracy from 500 lbs to 300 tons in a lightweight, compact design. The electronics are shock-mounted in a NEMA 4X/IP65 weatherproof aluminum or stainless steel enclosure for protection against moisture, dust and rough usage. Weights are easily viewed with the industry’s largest digital LCD readout (1.2 inches / 30mm). The easy to use membrane switches provide simple, trouble-free operation. Features include peak hold, set points for relay control and keypad setup/calibration. Operates on two (2) 9-volt alkaline batteries for up to 800 or more hours due to the high efficiency micro-controller. Hand-held remote control and wireless models are available. Up to 800 hours of continuous use. Wireless remote control models have reduced operating time. Tandem Display remote control includes 25' cable and displays on both the remote control and the tension link scale.